Today the state Senate Veterans Affairs & Emergency Preparedness Committee, chaired by Senator Randy Vulakovich (R-Allegheny), held a hearing on legislation that would establish the National Guard Youth Challenge Program in Pennsylvania. 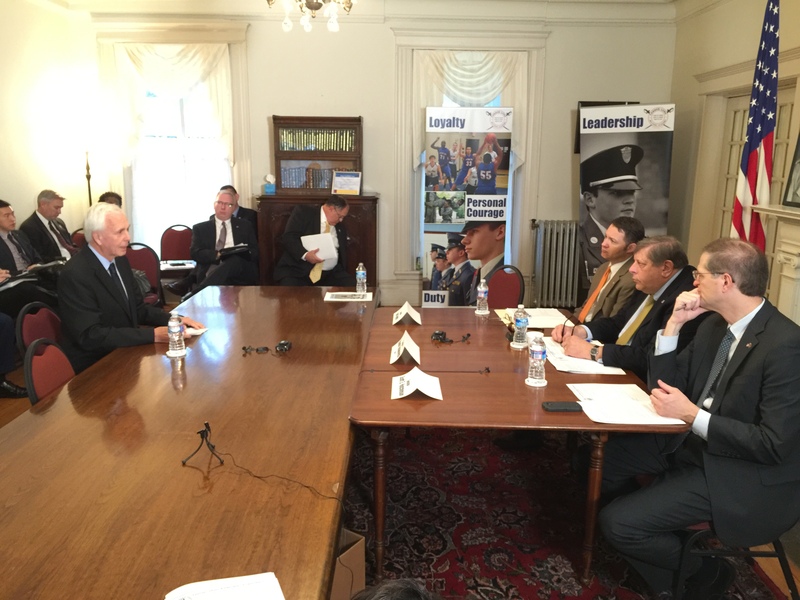 The hearing was held at the Carson Long Military Academy, located in New Bloomfield. Now in 27 states, Washington DC and Puerto Rico, the National Guard Youth Challenge Program provides a structured/quasi-military education to at-risk youth, aged 16-18. It is a free, voluntary, five and a half-month, dropout recovery program that helps at-risk youths earn their high school diploma or GED. The National Guard has been involved with their local communities for 370 years and this program is just one service the Guard provides locally. Started in 1993, the National Guard Youth Challenge program has educated 127,000 students nationwide. The National Guard provides 75 percent of the funds and the state provides the remainder. State Senator Stewart Greenleaf (R-Montgomery County), Chairman of the Senate Judiciary Committee, introduced Senate Bill 56 as a result of a conference he attended. He stated that it is imperative that we adopt a program like this to give high school drops another opportunity, rather than spending money on incarceration, which could cost $35,000 a year. Brigadier General Allyson Solomon (USAF, Ret. ), the President of the National Guard Youth Foundation, testified that the program costs an average of $14,000 per student, but that a recent study by the RAND Foundation found that for every dollar expended on the program , the benefits to society are $2.66. As such, their goal is to grow the Youth Challenge Program to serve 20,000 young people each year. Charles Rose, head of Maryland’s “Freestate ChalleNGe Academy,” stated that this program has been the best job that he has ever had as every day he sees the lights turn on in his students’ eyes. The State of Maryland graduates 70,000 kids a year, but unfortunately 8,200 students drop out. Now in their 45th Class since 1993, the Freestae ChalleNGe Academy has 100 students in each class. Lt. Colonel Timothy Gwin (U.S. Army, Ret. ), Executive Director of the Pennsylvania National Guard Associations, stated that this legislation is one of their top priorities for Pennsylvania. He stated that the program’s secondary education component would complement the National Guard Education Assistance Program, which provides a free college education to guard enlistees. Colonel Robert Langol, Director of Service Member and Family Support for the Pennsylvania Department of Military and Veterans Affairs, stated that Pennsylvania had 13,945 drop outs in 2013-14. He testified that the Department could start-up the program within 24 months of enactment. Chairman Vulakovich stated that he has learned a great deal about this program this year and supports its implementation. He announced that he will schedule the bill for consideration at the Committee’s next meeting on December 8th.